Just like in America, horse racing is one of Japan’s popular pastimes. Who dare can resist the excitement? Horses bolting from the starting gate amid a cloud of dust. Hooves clopping and whips cracking as tens of thousands cheer them on. In Japan, about 15.5 million fans attend about 21,000 races annually. 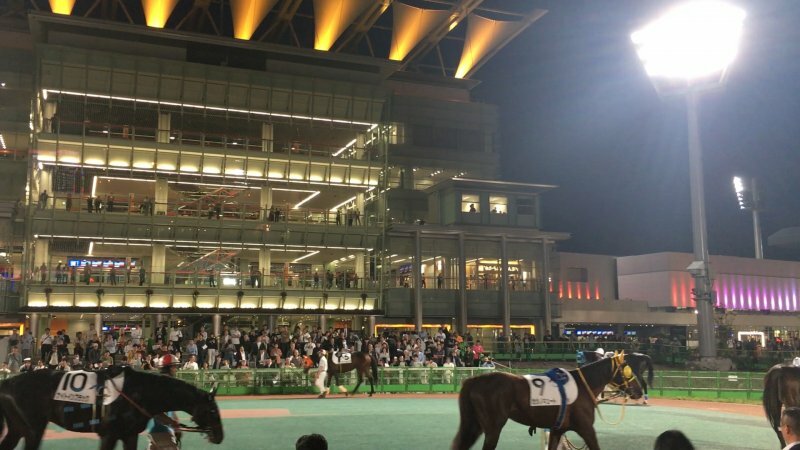 Among the 25 horse tracks available throughout mainland Japan, Ohi Racetrack aka Tokyo City Keiba (TCK) is one of the most popular racetracks as it is located in the center of Tokyo. More than 600,000 people visit the track each year. Besides its great location, the late races, called “twinkle races”, make this racetrack even more popular. The majority of races are actually held at night, as late as 9 p.m., allowing people to attend after a long day of work. Recently, a group of coworkers and I visited TCK on the way home to enjoy the late races. A 40-minute train ride from Hardy Barracks got us to TCK around 5 p.m. After paying 100-yen ($0.90) to get in, I found thousands of people busily studying and marking up race programs. The majority were Japanese salarymen in their 40s or older, but there were quite a few younger people, couples and groups of women, as well. Frankly speaking, I’m a beginner. Having been to the track a couple of times, I was still unsure of what to do. Thankfully, one of my colleagues has been attending the races for 30 years, so he was sure to come in handy. “Although it’s no guarantee, some knowledge of horses, jockeys and race conditions will help. Either that or a stroke of luck and a knack for picking good horse names or numbers will help,” He said with a chuckle. He said he’ll often buy tickets numbered 5-1-6, as that can read Koichiro, his first name, in Japanese. He suggested that as a beginner I should stick with betting on a single horse to win (tansho) or place (fukusho) rather than something riskier. I agreed and started looking for a single horse to bet on at the paddock. The rather quiet paddock was a fun experience. We watched as the horses followed one another under the track lights. I spotted a majestic-looking brown horse who gave me a glance. He had the look of a winner. I was confident in him winning the race, despite the odds saying otherwise. The cheapest ticket is 100 yen, but I tried a 500-yen place ticket, so I needed my horse to finish in the top 3. The crowd began to roar as the thirteen horses bolted out of the starting gate all at once, galloping along the one-mile track at breakneck speed for less than two minutes. My large brown horse, unfortunately, was completely off the mark and I lost my 500 yen. Luckily, there were five more races to come. And I was feeling lucky. TCK set a record for the largest payout in 2010 when a 100-yen ticket paid out roughly 25 million yen ($225,000). Why not me, I thought. The next race I bought several different combinations of horses, but made sure not to forget my coworker’s suggestion and picked a single horse for my tansho ticket, as well. Other colleagues of mine picked various horses – some guided by information on race papers or their phone and others by the funny names. Again, the crowd got loud and the horses were off. And, wouldn’t you know it, my horse came in first place this time, and a 300-yen tansho ticket won 900 yen. All my other tickets became trash, but I at least had one winner! When all the races ended around 9 p.m., I found myself down nearly 5,000 yen. But, although I lost more than I won, the races were very exciting and a great Tokyo experience at night - one I would suggest you try while staying in Japan. 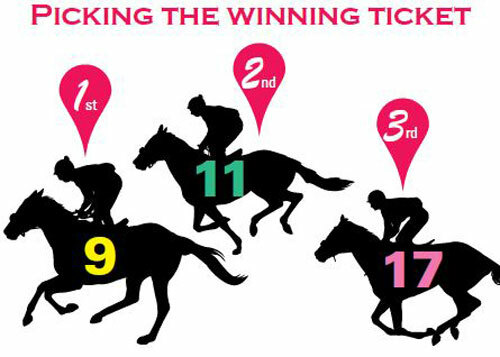 Purchasing a race ticket is fairly easy at TCK. You just mark the racetrack, race number, horse number, type of bet and the amount you are wagering on the betting slip before inserting it along with money into a ticket machine, which spits out your ticket. The forms are in Japanese, but the Japan Racing Association has an online guide in English (japanracing.jp/en/index.html), so English-speakers can enjoy the races. Horse racing was introduced to Japan by a group of British residents in Yokohama 153 years ago. The Japanese government made it a publicly operated industry, in part, to encourage quality breeding and training that could be used for military horses. Eventually, the pastime caught on with the locals. Despite its continued popularity, however, horse racing isn’t what it used to be, thanks to the recession and competition from other forms of amusement. The industry shrank from 45.5 trillion yen ($422 billion) in revenue and 27 million participants in 1993 to 34.5 trillion yen and 15.5 million participants in 2003. About 20,000 horses are actively racing at any given time. While the average lifespan for horses is around 30 years, the average career of a race horse only last 3-4 years. Location: 1-1-1 Furusaku, Funabashi City, Chiba Pref. Location: 1-5-1 Fujimi, Kawasaki-ku, Kawasaki City, Kanagawa Pref. Location: 10 Kamiyagita, Shinjo, Morioka City, Iwate Pref. Location: 4-5-1 Kitakata, Kokuraminami-ku, Kitakyushu City, Fukuoka Pref. Location: 3256-228 Nishitani, Ejimacho, Tosu City, Saga Pref.